This article is about the Toronto neighbourhood. For the nearby TTC subway station, see Rosedale (TTC). Rosedale is a neighbourhood in Toronto, Ontario, Canada, which was formerly the estate of William Botsford Jarvis, and so named by his wife, granddaughter of William Dummer Powell, for the wild roses that grew there in abundance. 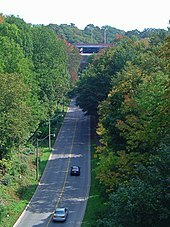 It is located north of Downtown Toronto and is one of its oldest suburbs. It is also one of the wealthiest and most highly priced neighbourhoods in Canada. Rosedale has been ranked the best neighbourhood in Toronto to live in by Toronto Life. It is known as the area where the city's 'old money' lives, and is home to some of Canada's richest and most famous citizens including Gerry Schwartz, founder of Onex Corporation, and Ken Thomson of Thomson Corporation, the latter of whom was the richest man in Canada at the time of his death in 2006. 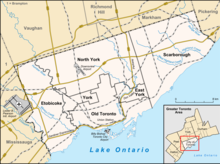 South Rosedale was first settled by Sheriff William Jarvis and his wife, Mary, in 1826 after Jarvis inherited his father's home there two years earlier. Mary Jarvis, the granddaughter of chief justice and loyalist William Drummer Powell frequently walked and rode on horseback around the trails for that formed Rosedale's meandering streets (which are one of the area's trademarks). She named the estate "Rosedale" as a tribute to the abundance of wild roses that graced the hillsides of their estate. The Jarvis estate was subdivided in 1854 and became Toronto's first "garden suburb". 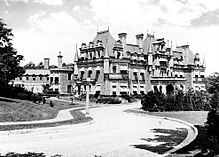 The Jarvis Family sold the Rosedale homestead in 1864, which led to the residential development of the area soon after, including the extension of Cluny Drive. A noteworthy piece of Rosedale's History, is that it was home to Ontario's fourth Government House. The house was called Chorley Park, and it was built for the Lieutenant Governor in 1915. It was demolished in 1960 by the city of Toronto to save money. It is now a public park of the same name. Ravines surround the neighbourhood of Rosedale. Rosedale is built among three ravines, preserved as parkland. 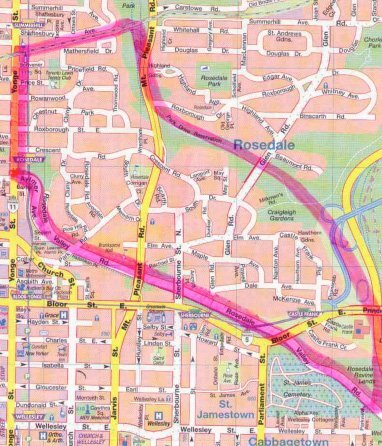 Rosedale is full of cul de sacs and convoluted routes through the neighbourhood, which coupled with other physical boundaries (such as the ravines and bridges) lead to low levels of vehicular traffic. Even though Rosedale is located in the middle of Toronto, virtually no vehicular traffic can be heard with the abundance of trees and foliage that surround the community. The homes are mostly single family detached dwellings, many of which are at least 100 years old including some former farmhouses that are closer to 200. Houses range from Edwardian and Tudor in style to the more common Victorian and Georgian. Rosedale Park is home to the annual spring park party, Mayfair. The event typically consists of rides, games, flea market and other such carnival-like activities. The event is traditionally on the first Saturday in May and is run and funded by Mooredale House. According to Census tracts 0086.00 and 0087.00 of the 2006 Canadian census, Rosedale has 7,672 residents, up 4.8% from the 2001 census. The median income in this Census Tract in the 2006 Canadian Census was $55,906, while the average total income in this Census was $165,827, one of the highest incomes of all Toronto neighbourhoods. The median income level was also double that of Canada and Ontario, while the average total income levels were 4.5 to 5 times larger than that of Ontario and Canada. Similarly, the total income levels reflected in the 2011 National Household Survey (NHS) were exceedingly high with the total income median at $61,284, more than double that of Ontario and Canada, and the total income average at $210,484, more than 5 times that of Ontario and Canada. In 2015 the average Rosedale house sold for over $1,800,000. Additionally, Rosedale possesses a large population of people of English, Scottish, and Irish ethnic origin. North Toronto station is a former Canadian Pacific Railway station located in northwest Rosedale. Branksome Hall is an all-girls school located in Rosedale. Branksome Hall - an all-girls school. Rosedale is represented in the House of Commons by Chrystia Freeland and is a part of the Toronto's central district, renamed to University-Rosedale in 2015 and formerly known as Toronto Centre. In Provincial Parliament, Rosedale is also a part of the University-Rosedale electoral district, and is represented by Jessica Bell. Japanese composer Toru Takemitsu wrote a three movement piece for solo guitar called "Into the Woods" in 1995 whose second movement "Rosedale" was inspired in this area of Toronto. ^ "Rosedale - Toronto Luxury Realty". ^ "The Best Places to Live in the City: A (Mostly) Scientific Ranking of All 140 Neighbourhoods in Toronto | Toronto Life". torontolife.com. Retrieved 2017-10-22. ^ "Rosedale - old money and new luxury". ^ "#9 Kenneth Thomson & Family". ^ http://southrosedale.org. "About Us | South Rosedale Residents' Assoc | The SRRA is one of Canada's oldest ratepayer groups. Formally incorporated in 1931, the Association is committed to providing South Rosedale's residents with a strong voice relative to the area's unique position as one of Toronto's most desirable residential communities". southrosedale.org. Retrieved 2015-09-02. ^ "Image: SouthRosedale_MAP2.jpg, (382 × 446 px)". southrosedale.org. Retrieved 2015-09-02. ^ Marsha Kelmans (15 May 2003). "South Rosedale Heritage Conservation District Study, November 2002" (PDF). Retrieved 2015-09-02. ^ "Rosedale - Toronto Historical Association". ^ "History of Rosedale". Toronto Neighbourhood Guide. ^ "Historicist: The Saga of Chorley Park". ^ "Biography – HEPBURN, MITCHELL FREDERICK – Volume XVIII". ^ "How Much Are Homes in Toronto Neighborhoods". ^ "Federal Election 2015: University-Rosedale riding results".